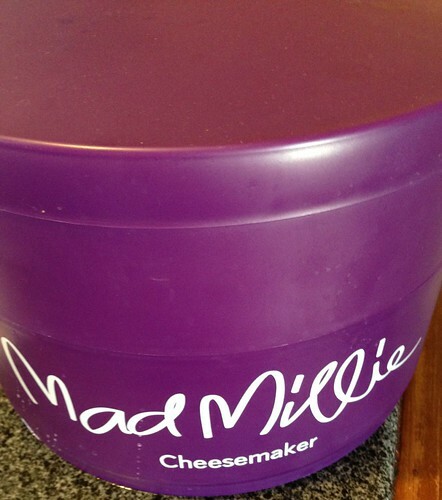 I received a cheesemaking kit for Xmas. 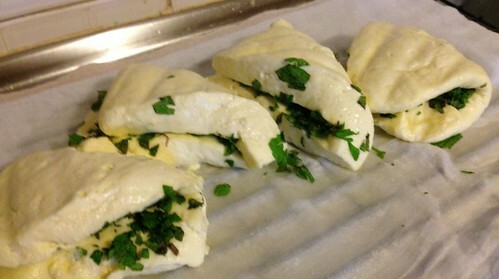 Having made feta a couple of times, I decided to branch out and try haloumi. 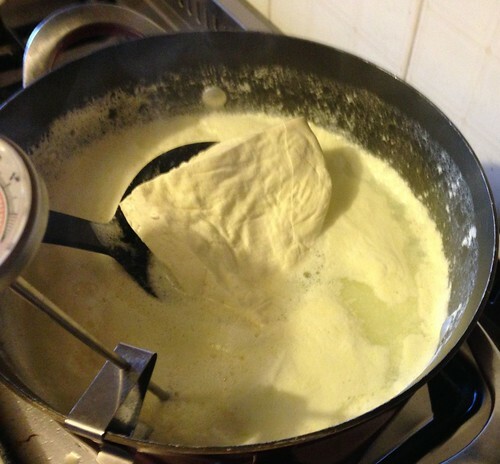 People were interested on twitter, so here it is: the process of making haloumi from scratch. Well, from milk. If you have a dairy goat or cow, more power to you: you can really make it from scratch. Maybe you can. And if you’re a visual person like me, maybe this walkthrough might help a little. Total prep time is 3-3.5 hours (not counting the sanitising step beforehand), but you spend a lot of that time not doing anything. 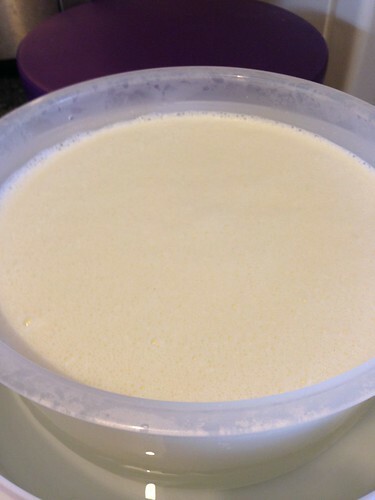 Step one: good full-cream non-homogenised milk. I’ve tried two different pasteurised non-homogenised cows milks, and one made a much creamier better-textured cheese than the other. You can use homogenised milk, you need to add calcium chloride to the milk after the initial warming step; this is not something I’ve tried. 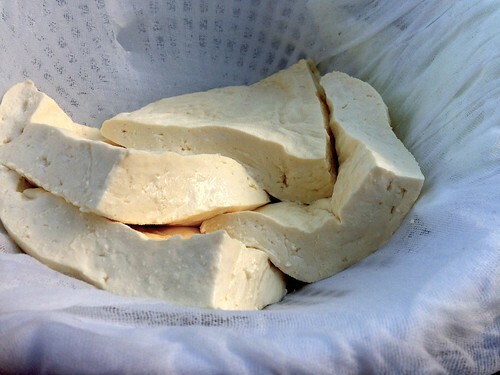 For haloumi (but not feta), I’d be comfortable using unpasteurised milk, as there’s a cooking step involved; but those decisions are up to you. 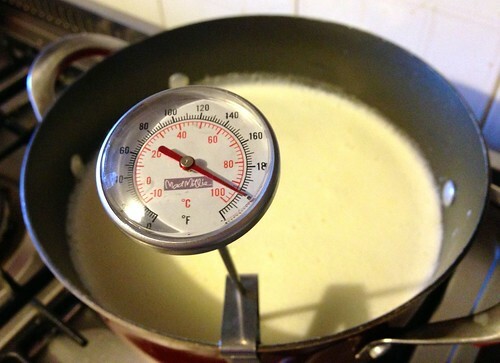 You can leave the milk out for an hour or so before starting to make the cheese, to get it a little less cold. Next: sanitise all of your equipment and surfaces. Iodophor solution is provided in the kit I use (Mad Millie). Your surfaces you can wipe down with vinegar. I use fresh paper towels to lay my equipment on. 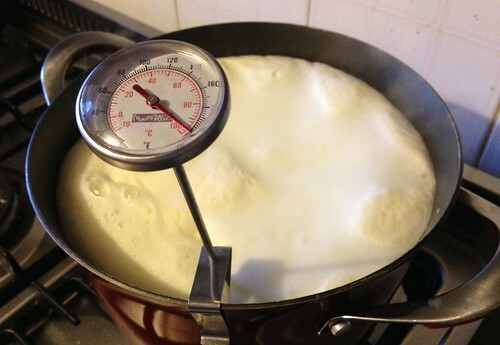 Then it’s on to the actual cheesemaking! This is, as you might imagine, very image heavy. Most of the steps take far quicker to do (especially if you don’t have one hand holding a camera) than to document. Most equipment will be in a moderately well-equipped kitchen, and you can improvise an incubator with blankies and suchlike, but you do also need a proper fine cheesecloth, a good thermometer, and non-iodised salt. To begin: incubate at 45 for 90. 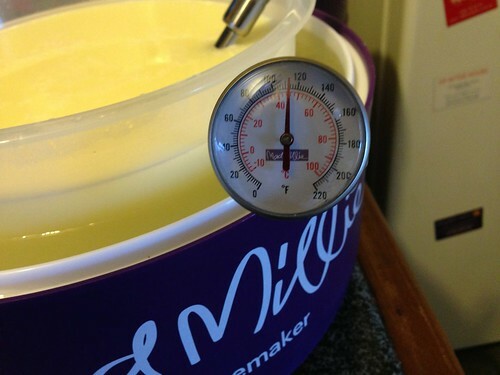 Warm four litres of milk to 45 C, and incubate for 90 minutes. You can wrap towels/blankets around your pot, or incubate in a warm water bath in a large esky, or buy a cheese incubator kit. Check temps partway through and adjust your water bath, if you’re using one, with hot water. After those 90 minutes are up, you need to check for a clean break. 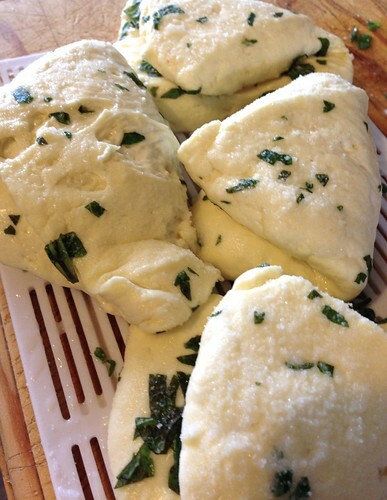 With a blunt straight knife, make a surface cut in the cheese, and check that it ‘breaks’ cleanly. 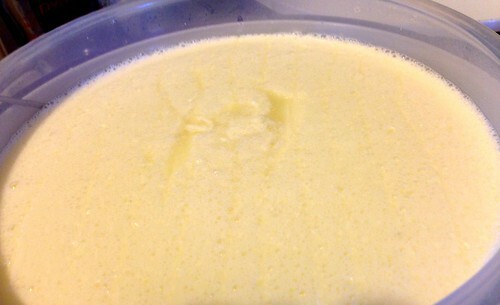 Whey should pool in the break, and it should neither be too clear nor have lots of bits floating in it. When you get that break, slice the cheese vertically in a grid, with slices about 1-1.5 cm apart. 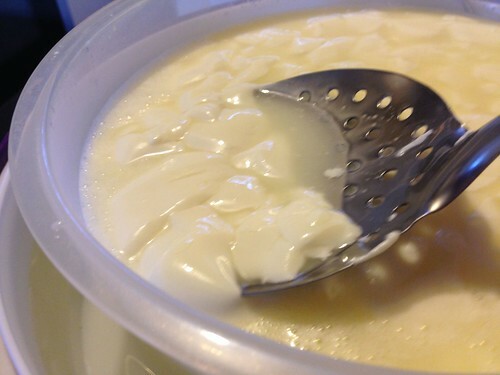 You’re going to be aiming for very approximate cubes here, so let the curds settle for a moment (they start to separate fairly quickly by themselves at this point), then cut horizontally with a large flat metal slotted spoon. If you don’t have one of those, you can instead repeat the cuts in the previous step but with your knife at a 45 degree angle. 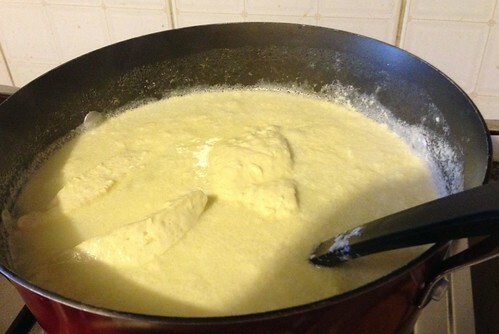 Then start to gently stir the curds, cutting too-large ones against the side of your pot with the spoon. 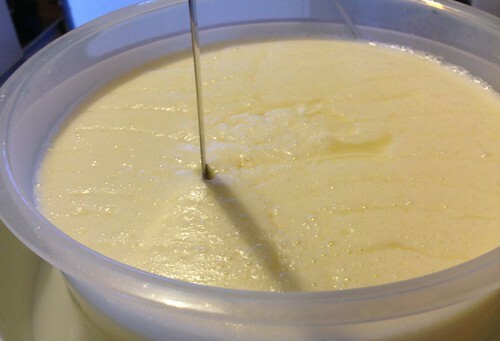 Keep the curds moving gently for around ten minutes. They should shrink nicely. 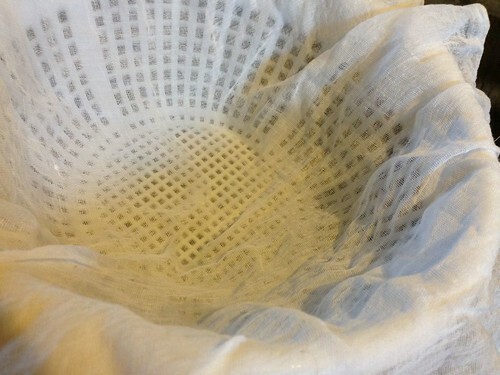 You can take a brief break to line your colander with the cheesecloth, and place it over a large pot. See how much the curds have shrunk? Drain them in the colander. Slowly and carefully, because they will clog the cloth. … and weight it gently to press. 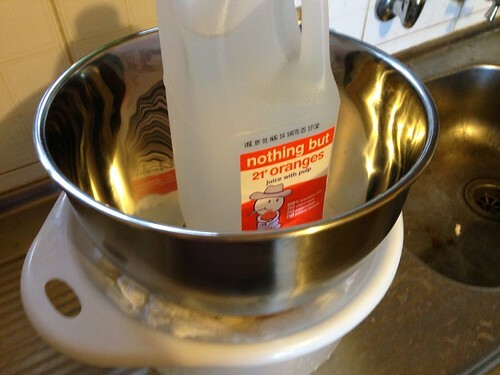 I use a metal bowl on top with a two-litre bottle of water, for 20-30 minutes. Other people press with varying weights (or with their hands), for five minutes to five hours, so this doesn’t seem to be a particularly sensitive step. 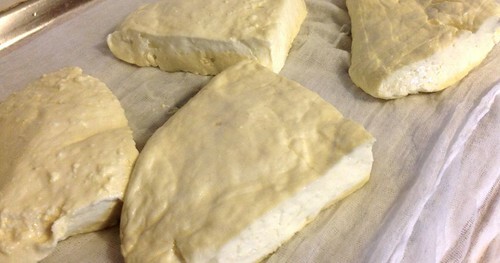 When the curds are consolidated and springy, cut into wedges with that blunt knife. 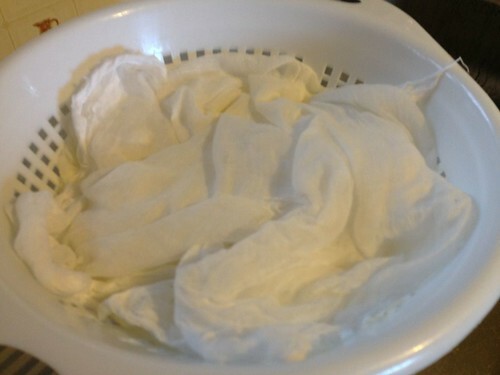 Don’t cut your cheesecloth! Aren’t they beautiful? Handle with care, they’re still pretty fragile. Meanwhile, if you were prepared, you’ve heated the drained whey up to about 95 degrees. 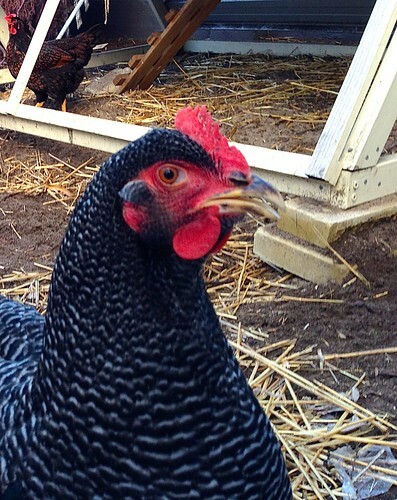 And talk to the chickens. Whatever you do, though, DON’T BOIL THE WHEY! It will boil over in a trice. Just bring it to the boiling point carefully, then switch it off. 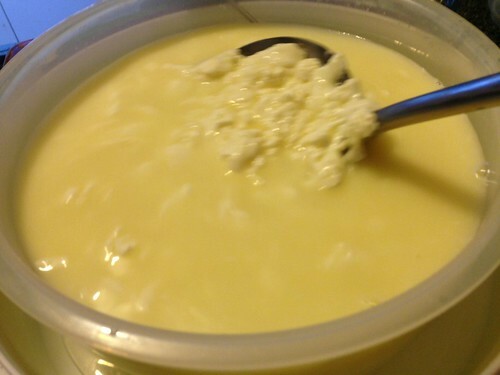 Lower the cheese wedges into the hot whey with a slotted spoon. Very gently ensure that they’re not sticking to the bottom. Put a lid on. Leave them in the hot whey for about 10-15 minutes (heat off, remember!). When they float to the top, they’re cooked. 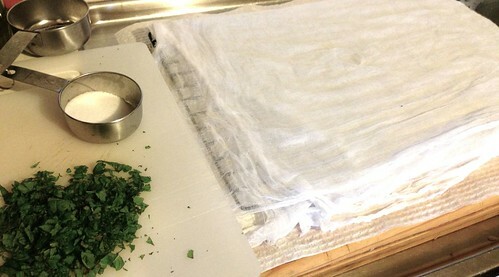 While the cheese is cooking, prepare your draining rack, about 20 grams of non-iodised salt, and the chopped mint. 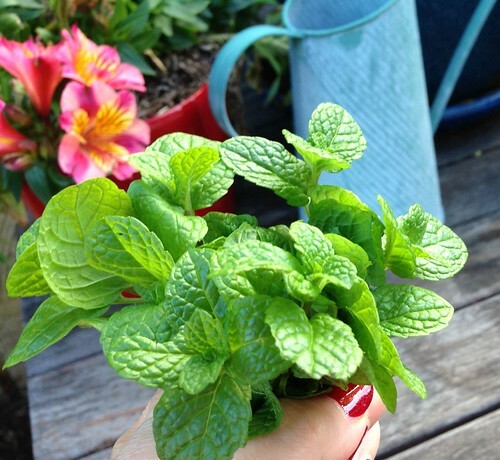 You could use other herbs, or none, but mint is traditional. Lift the cooked wedges out of the pot. And drain and cool them on the rack. You can press them a little with your hand to help the fluid out. Some people dunk them in cold water; I don’t. And fold them over. Then sprinkle the outsides with the rest of the salt. Gently press them a bit more. Once cool, they’re ready to wrap in cling film and store in the fridge for 1-2 weeks. Want fried pictures? You’ll have to wait. I’ve not managed to take any yet, as the fried cheese, lemon juice squeezed over the top, disappears into someone’s gob far too fast every time. Each triangle makes around five slices. I’m trying that! Thanls for posting this. I made these a couple of weeks ago when on holiday in Bright with young nieces and nephews. Forgot to bring any of my cheese moulds (though I remembered just about everything else), so we hastily improvised a contraption involving cheesecloth, a yoghurt container punched through with holes, and a bread board with several heavy jars stacked precariously atop (a weight). After several terrifying crashes and an entirely predictable result (a jar of tomato paste cracking all over the floor) I ended up just forcibly pressing down on the cheese myself for half an hour. 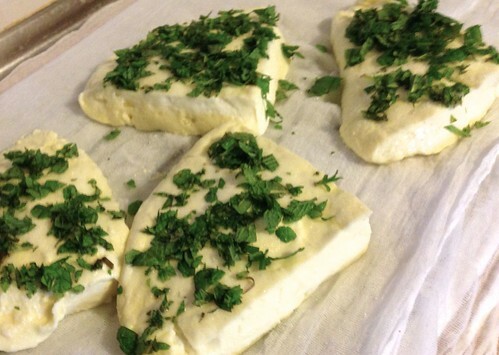 Hi Tim – yes, the haloumi doesn’t seem to need a huge amount of pressing, unlike some other cheeses. Which is good, as I don’t have a press (yet). Most things I’ve read about calcium chloride as an additive say that it’s for homogenised milks (and sometimes other milks under certain feed conditions, or for goats milk), though some sites just say “store-bought” or “processed” milk, which is not terribly helpful. 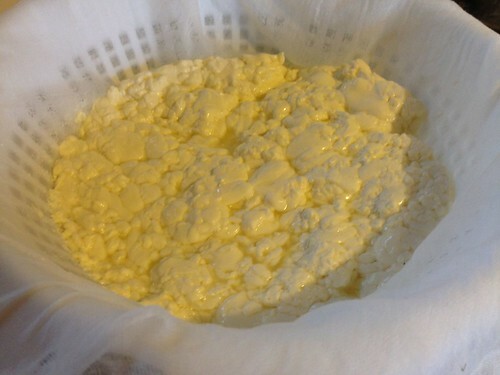 My curds form up plenty strong with the pasteurised non-homogenised milk that I use, as you can see, no CaCl required. However they do say that their milk has been “carefully pasteurised”, so I’m guessing the process used is low-heat. 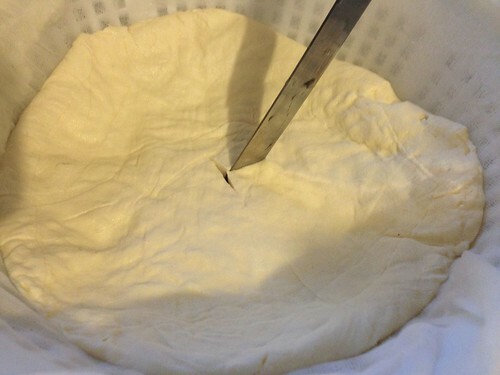 The pressing stage is definitely a problem for making firmer cheeses if you don’t have the right infrastructure. Something like feta requires 3-4kg of pressure, which is difficult to get in something small enough to sit on top of a cheese (unless you have some of thise small barbells lying around the house). And for hard cheeses you need heavier weights still. Another thing to be careful of with the milk is how old it is. 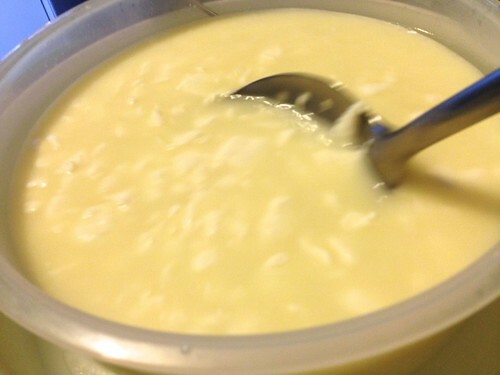 Milk gets more acidic as it ages and this can affect curd formation. 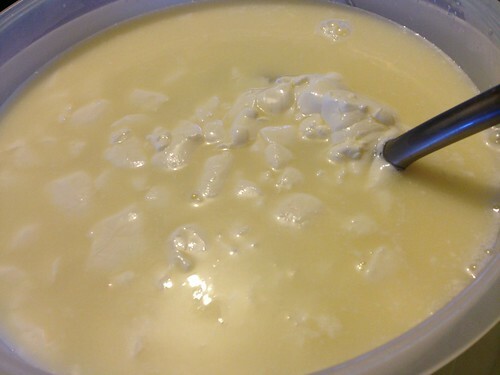 The first time I made cheese I used supermarket milk that I had bought a few days earlier. Between the unknown period of time it had been on the supermarket shelf, and the time I had kept it, it had quite a noticeable effect. Hi angharad, I don’t press my cow’s milk feta, but I haven’t tried it with goat milk. I don’t want a firm block with perfect rectangular slices with feta, though – we mostly use it for putting in salads or smooshing on bread. Definitely yes on the freshness! Our milk comes into town on Monday, is delivered Tuesday, and I make cheese Tues night or Wed morning.